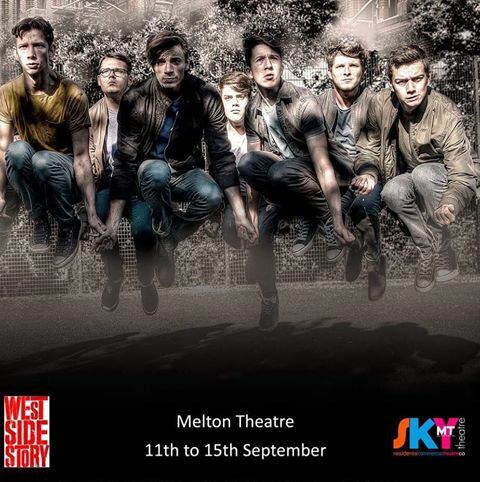 Promo: Preview of West Side Story by Sky Theatre. Melton Mowbray. – East Midlands Theatre. 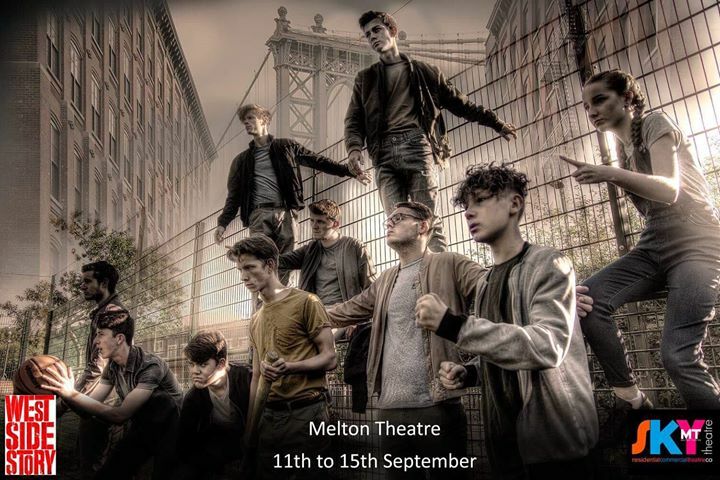 Sky Theatre are set to raise hair and pulses with their gritty upcoming production of West Side Story which opens on September 11th at Melton Theatre. West Side Story is a tricky show to get right. All too often, even experienced directors dive into the same rabbit hole to a world of high-kicking jazz hands fabulousness, showing complete irreverence to the more sinister elements of the text. Yet, as one of the best-known musicals of our time, and a retelling of arguably the greatest love story in English literature, this is a show that must be handled with care. And so, it was with some trepidation that I recently attended a specially staged dress rehearsal for Sky Theatre’s upcoming youth production of the show. However, within moments of the prologue starting, it became clear that this production is in very capable hands indeed. 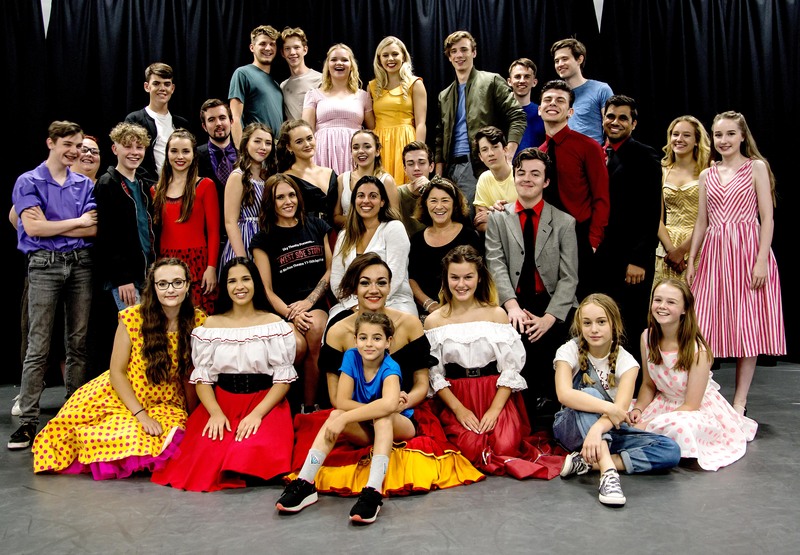 Under the seasoned guidance of Director, Suzanne Forrester and Assistant Director, Claudette Caven Henrys, Sky’s production is alive with movement, and performed by a cast of 14 – 25 year olds whose talent and maturity far exceeds their years. With spectacular dance sequences, flawless vocals and mature acting skills, the production moves effortlessly between jubilant chorus numbers, light-hearted comedy and hair-raising pin-drop moments. Even at this pre-performance stage, it was a joyous and poignant spectacle. For those not familiar with West Side Story, it is a contemporary retelling of Romeo and Juliet with music from Leonard Bernstein, lyrics from Stephen Sondheim and book by Arthur Laurents. Set in 1950s New York, the two households, both alike in dignity are replaced with street gangs – the Jets, natives of the New York West Side; and the Puerto Rican Sharks. The star-crossed lovers themselves are replaced by Tony, a Jet, and the Puerto Rican Maria. With a gangland setting, stage combat is pivotal to the show, and in that regard, choreographer, Jess Allsop, has pulled no punches (pun, apologetically intended). Drawing on the expertise of Mark Ruddick, a professional stage combat trainer providing workshops for stage and film, including work on Captain America: Civil War, Jess has assembled intense, believable fight sequences that retain musicality, without ever becoming frivolous. In terms of the dance, Jess has pulled out all the stops, with each number a dazzling showcase of the impressive skills within the cast. With acrobatic moves, group and individual sequences, each piece has been intricately set to make best use of the talents available, at times creating a riot of movement. The opening sequence I could watch a dozen times and still see something new. Elsewhere there is delicacy and grace, notably so in the dream sequence during the song ‘Somewhere.’ Juxtaposing the balletic with the eclectic, Jess has created the perfect counterpoint to the turmoil faced by Tony and Maria, delivered beautifully by the talented dancers in the cast. Musical Director, Sam Griffiths, has also driven a wonderful vocal performance from the cast. The chorus numbers are tight with well-balanced harmonies, delivered with energy and commitment from all. The raucous chorus of the gangs contrasts beautifully with the pure and melodic vocals from the leads, illustrating perfectly the tenderness of the love between Tony and Maria and the harsh backdrop against which it is set. The story leaps frequently from lighter moments to dark, intense and sometimes distressing scenes, often within the blink of an eye. The cast cope with this incredibly well, all displaying the maturity and intelligence of performance required to handle the subject matter sensitively and keep the audience engaged. The roles have been cast well, with all principals developing strong relationships with their opposite numbers. The camaraderie between the Jets and the Sharks is particularly strong with both gangs portraying a sense of fraternity that clearly goes beyond the stage. Similarly, the Puerto Rican women provide some of the funnier moments of the show, their excellent comic timing and punchy delivery enhanced by chirpy Hispanic accents. In all, the performance I saw was fast-paced, dynamic and bursting with energy; it will only get stronger still with the impetus of the band and an eager audience. 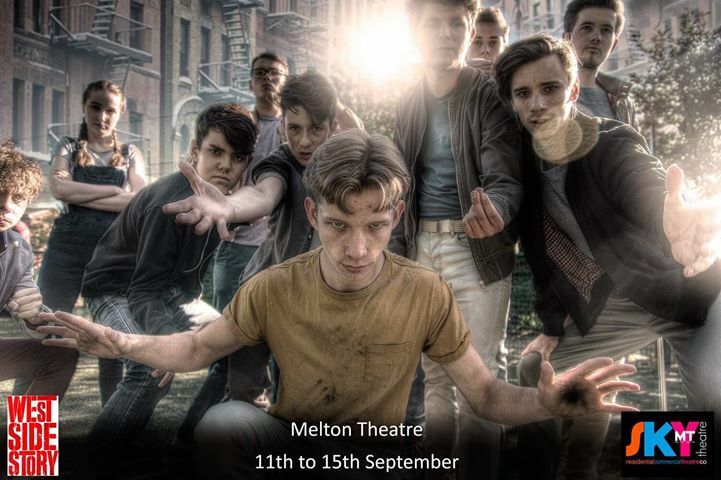 The show appears at Melton Theatre from the 11th to 17th of September and tickets are available from meltontheatre.co.uk or by calling the box office on 01664 85 11 11. Got my tickets, one of my favourite shows can’t wait to see these wonderful youngsters .